This post will be focused mainly on tools and techniques that allow you to look at a network and see IP 4 characteristics like TCP open ports, responsive nodes on the network, OS searching. Some of the tools in the post will be things like nMap, Zenmap, Wireshark. Scan IP addresses 10.0.1.1 through 10.0.1.254 looking for IPs with port 80 Open. As you can see by default it tries to guess the operating system and service name, also returns the MAC address. You can do a range of ports by changing the “-p 80” to “-p 90-443”. You can do a range of ports by changing the “-p 80” to “-p 90-443”. 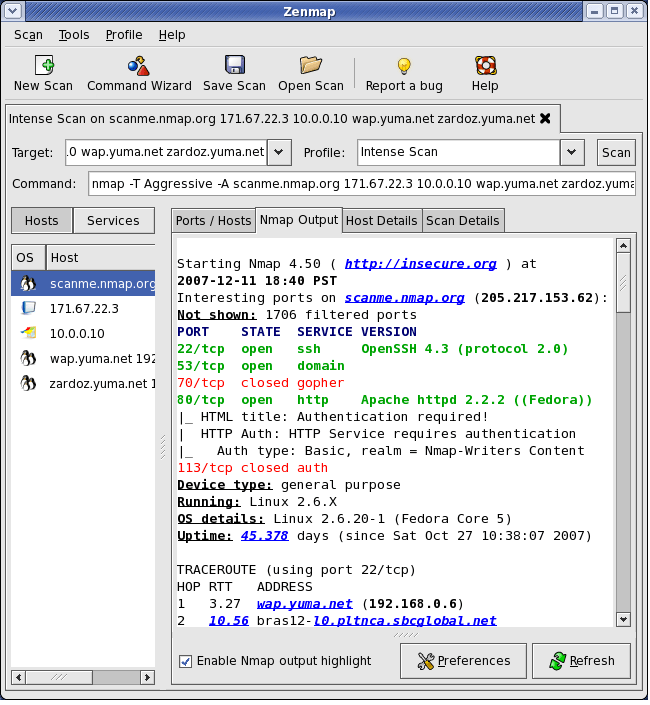 Zenmap is a GUI that can go with Nmap. The command switches may not be for you. also zenmap will show the commands needed based on your Gui choices, so a good way to learn.